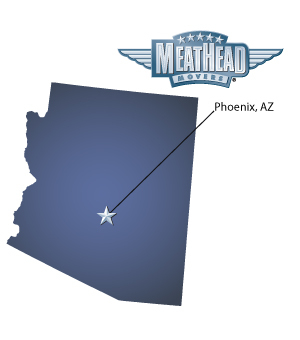 If your future includes a move to Phoenix, check out Meathead Movers! Our professionally trained student-athlete movers, moving concierge, and princess packers are prepared to get you safely moved into your new Phoenix home. When you make your move to Phoenix, be sure to contact Meathead Movers. No matter what type of moving service you need, our student-athlete movers are ready to handle all your moving needs. Boasting hot summers and temperate winter, Phoenix is a popular destination for visitors who love fun in the sun and families who want to live in a gorgeous desert environment. If your family is moving to Phoenix, you are sure to enjoy the area’s beautiful climate, many recreation opportunities, and excellent schools. Of course, making the transition from one city to another isn’t always easy. That’s why choosing professional Phoenix movers is so important. The capital of Arizona, Phoenix is currently considered the 13th-largest metropolitan area in the U.S. While the city was first settled by Americans in 1867, the area has a rich history going back to the native Hohokam people. Today, the region still celebrates its rich Native and Hispanic heritage. A wide variety of arts and culture venues that celebrate both Native and modern residents of the area are popular among tourist and locals alike. The Phoenix Center for the Arts, Latino Institute, Pueblo Grande Museum and Heritage Square are among the most popular attractions in the city. Of course, there is plenty to do and see besides history in this city. Phoenix hosts a variety of concerts, sporting events, and other activities for its residents and visitors. For those who enjoy the outdoors, a wide variety of desert parks, preserves, and hiking trails await. Making the most of your move to this dazzling city means choosing the right movers who understand your needs and know the local area. All our movers are friendly, clean-cut student athletes who study at nearby colleges such as Arizona State University. We know that interstate moves can be stressful, which is why we make sure that the same moving team is with you from beginning to end. Whether it be a local, long distance, or commercial move, Meathead Movers is here to serve you. Of course, moving is about more than just getting your possessions from one place to another. It’s also about carefully packing your belongings and preparing for life in your new community. Our Princess Packers are here to help you get ready for the big day by carefully boxing your possessions. Our Moving Concierge goes above and beyond by helping you understand which utility companies and service providers are available at your new home. Moving to Phoenix means starting life anew in Arizona’s dazzling desert. We are so confident in our services, that we even offer a 100% satisfaction guarantee! So, what do you have to lose? Contact Meathead Movers today for a free moving quote, and learn how we can help you on your next move! Having moved more than a few times, this was the best moving team we've ever seen. They were very professional, personable, reliable and careful. They took extra efforts to protect our floors and took extremely good care of all of our things. I would highly recommend them if you want the job done right.